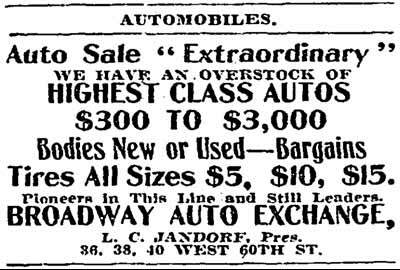 Broadway Automobile Exchange, Jandorf Automobile Co.
Louis C. Jandorf was an entrepreneur who was ahead of several trends, doing well in them. 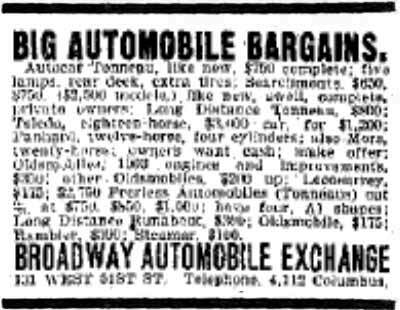 Before the turn of the century,he was well known in New York City as a successful bicycle dealer. 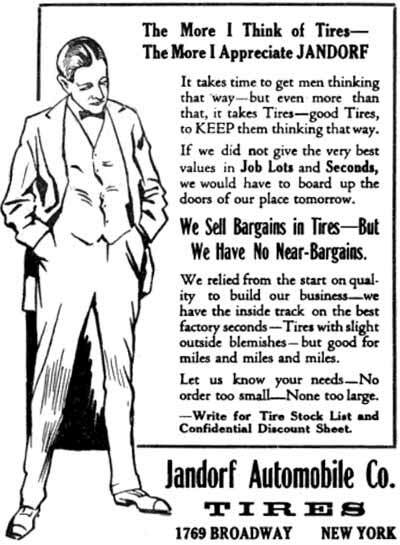 In 1900 his firm was one of the first in the country to specialize in used automobiles. 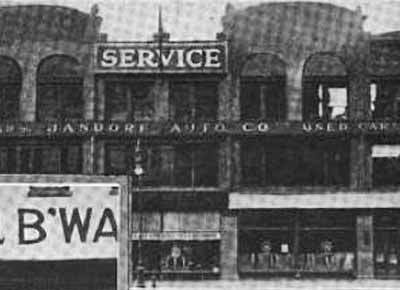 He also pioneered the trade in new and used automobile coachwork. Louis C. Jandorf was born in Cincinnati, Ohio in May of 1868 to Pfeiffer and Rachel (Shineberg) Jandorf. Pfeiffer, a jeweler by trade, was born in Hengstfeld, Germany on December 11, 1833 to Refen Lippmann (b. Jan. 25 1805-d.Nov. 19 1874) and Baesle (Feldenheimer) (b. Jul. 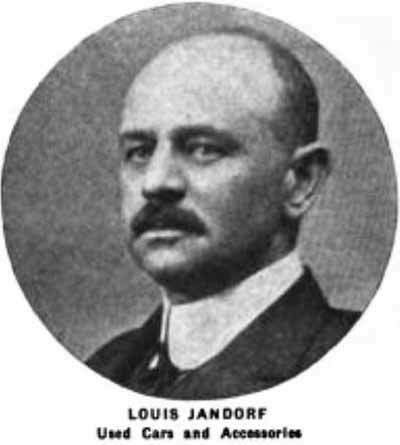 19 1807-d.Apr 2, 1866) Jandorf. Born in Florida during March of 1846, Louis’ mother, Rachel (Shineberg) (b. Mar. 1846-d.Aug 5, 1917), married Pfeiffer on November 11, 1863, shortly after which they moved to Cincinnati, Ohio were he established a jewelry store. To the blessed union were born 8 children as follows: Grace, Sadie, Elsie, Clarence, Horace H. (Harry), Louis C., and Blanche Jandorf – all of whom were born in Cincinnati. 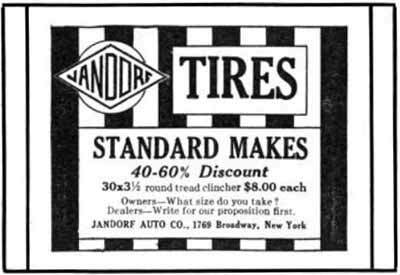 Business was sufficient to enable Jandorf’s marriage to Anna V. Brown (b. Jan 1870 –d. 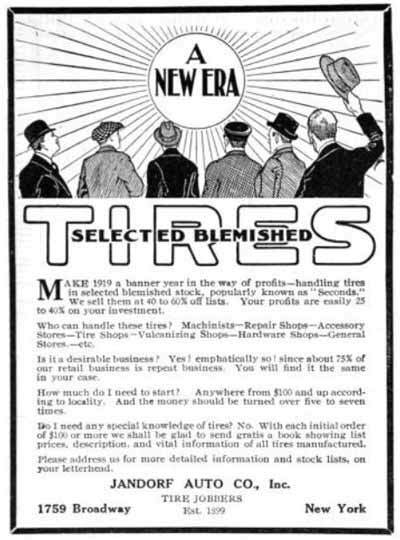 May 1909) in early 1893. On October 1, 1893 the newlyweds were blessed with the birth of a son, Sidney Ralph Jandorf (b. Oct. 1, 1893–d. Mar. 1981). 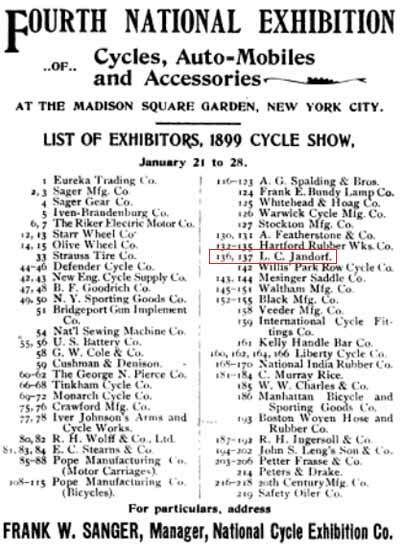 Jandorf’s reputation was such that his visit to the 1896 New York Bicycle & Automobile show – held at Madison Square Garden - was recorded in the January 26, 1896 issue of the New York Times. 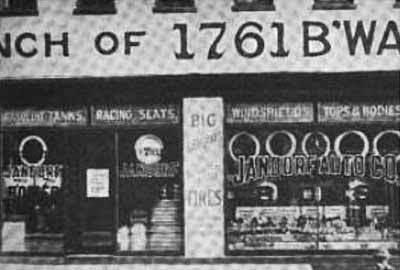 A fire struck Jandorf’s bicycle shop at 8:04 A.M. on Dec 17, 1897, after which he relocated his operations to 23 Barclay St., corner of Church St. A separate firm, the Jandorf Bicycle and Export Co., 86 Warren St. New York, New York was organized around that time, although their exact line of work is unknown. 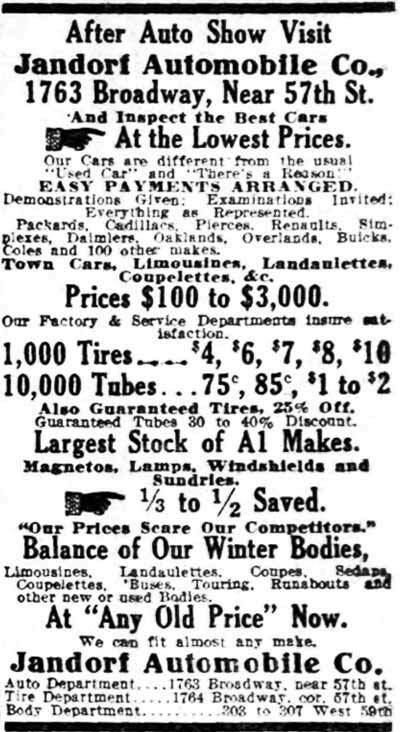 The January 22, 1899 issue of the New York Times listed the firm as an exhibitor at the 1899 New York Bicycle & Automobile Show, which was held at Madison Square Garden. 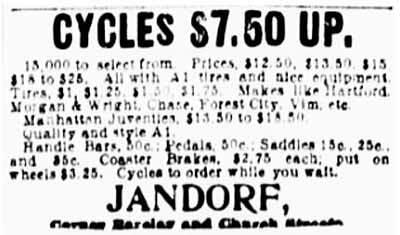 The 1900 US Census lists Louis C. Jandorf occupation as “bicycles”. The 1900 Annual report of the factory inspectors of the State of New York list the firm with 12 employees. 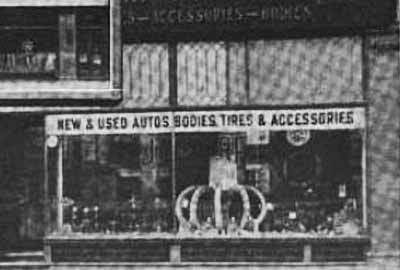 The Columbus Auto Exchange took over 1780 Broadway when Jandorf relocated to 151 West Fifty-first Street, and in 1908-1909 the building was razed by the B.F. Goodrich Rubber Co. who constructed a modern 12-story office building and garage on the property, which remains standing today. 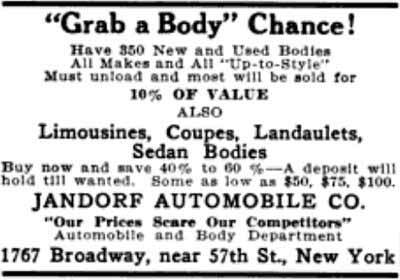 Broadway Automobile Exchange (NY) (Louis C. Jandorf. Pres. Horace H. Jandorf, Sec. Capital, $2000. 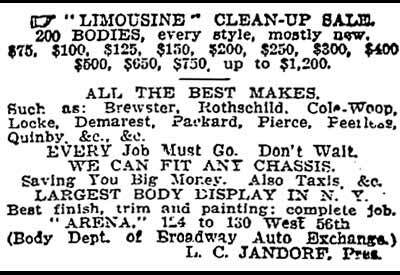 Directors Louis C. & Horace H. Jandorf, John Brown; 239 W. 56th St.
“LIMOUSINE CLEAN-UP SALE. 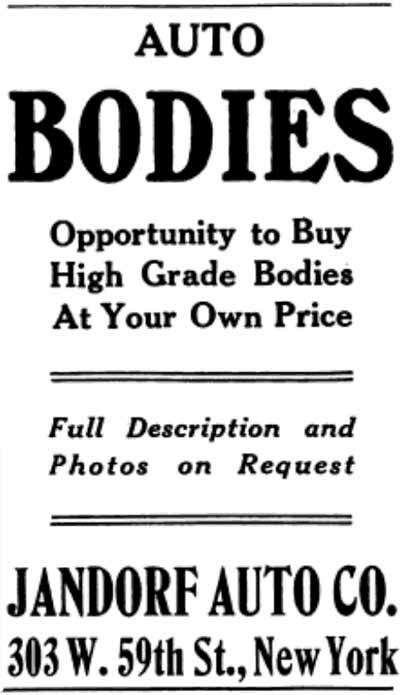 200 BODIES, every style, mostly new. $75, $100, $125, $150, $200, $250, $300, $400, $500, $650, $750, up to $1200. “ALL THE BEST MAKES. 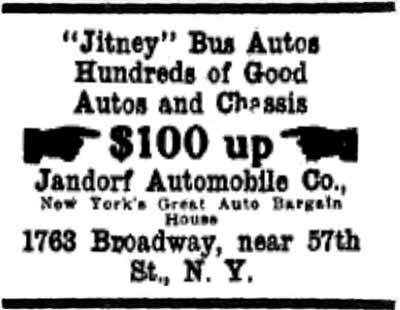 Such as: Brewster, Rothschild, Cole-Woop, Locke, Demarest, Packard, Pierce, Peerless, Quinby & C., &c.
The 1912 New York State Industrial Directory listed Jandorf’s 854 Eleventh Ave. factory as having 89 male employees, so it’s assumed his total payroll was significantly higher than that, as he was currently operating out of 5 separate facilities; 42 West Sixty-second Street, 854 Eleventh Avenue, 124 to 130 West Fifty-sixth Street, 230-245 West Fifty-sixth Street and 1763-1765 Broadway. “Old U.S. Motor Co. Building Leased. 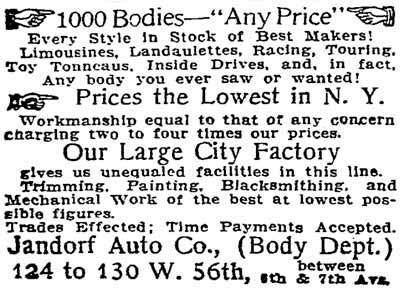 “Jandorf Leases U.S. Motor Building. “Four men were injured, none of the seriously, last night when an automobile fell down the elevator shaft in the garage of the Jandorf Automobile Company, at 3 West Sixty-third Street. The Auto Was Wrecked. The injured men were Samuel Simon, a chauffeur of 560 Greene Avenue, Brooklyn; Edward McAvoy of 531 West Fifty-Third Street, George Rosenstock of 643 Cauldwell Avenue, the Bronx; and Samuel Aronson of 255 Vernon Avenue, Brooklyn. They all went to their homes after treatment at the Polyclinic Hospital. 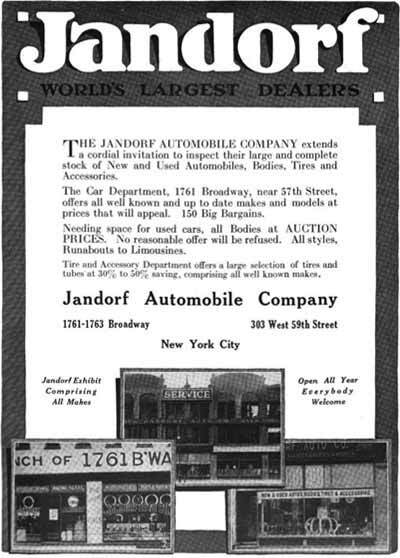 "Jandorf Automobile Co., NY: Louis С. Jandorf, Pres. ; Howard R. Bliss, Sec. ; Capital $10,000. Directors: Louis С. & К.К. 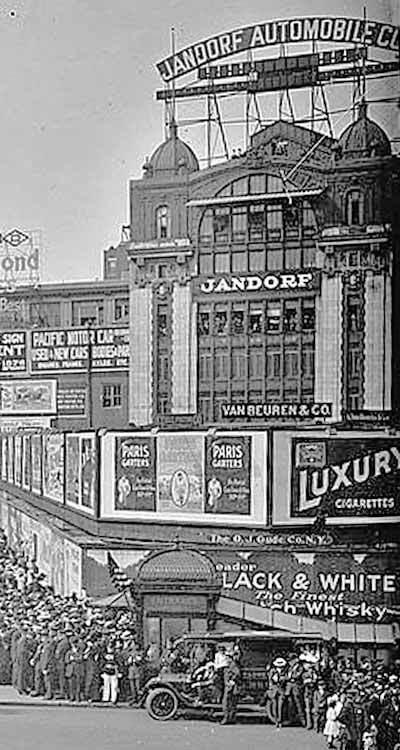 & S. Jandorf; 1761 B’way." 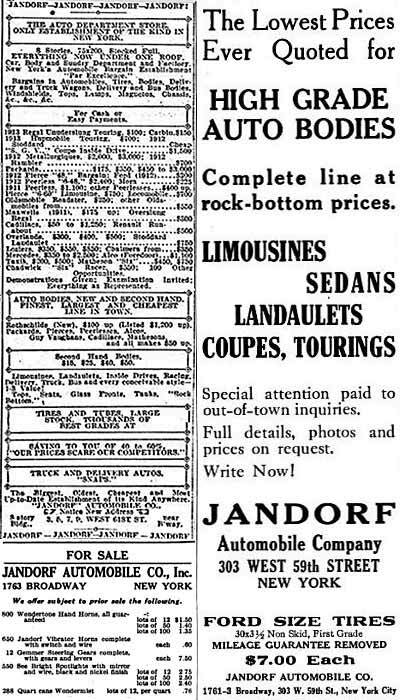 After his 1915 graduation from the Cornell University Law School with a LLB degree (undergraduate law degree) Sidney R. Jandorf, Louis’ son, joined the management team of the Jandorf Automobile Company. 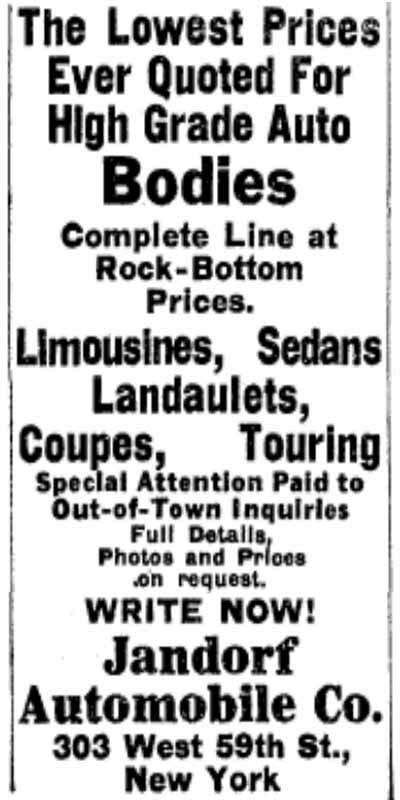 “Limousine, landaulets, coupes, taxis, &c . in stock, low as $25, $50, $75, &c.
“EXPLOSION FATAL TO MRS. JANDORF; Manufacturer's Wife Dies After Blast of Gas Stove in Long Island Home. 2 SERVANTS BADLY HURT. Maid and Butler Burned Trying to Save Employer, Who Lit Match Near Full Tank. “SANDS POINT, L.I., Aug. 2. -- Mrs. Katheryn Knowles Jandorf, wife of Louis C. Jandorf, the former automobile accessory manufacturer, died today in Port Washington of burns she received on Monday afternoon when a tank of propane gas exploded in her home here and injured her, her maid and the butler. The latter two, Robert and Sarah Rader, are in the Doctor’s Sanatorium in Port Washington in a serious condition also suffering from burns received when they tried to put out the flames on Mrs. Jandorf’s clothing. “Nothing was known of the accident until Mrs. Jandorf’s death today. According to the story told the police, Mrs. Jandorf was directing the maid and butler in removing an empty gas receptacle and connecting a full one, that being used the type of gas equipment used for cooking in the fourteen-room house. While the air was still charged with the gas that had escaped Mrs. Jandorf is said to have struck a match to try the stove. “The stove exploded and the oven door blew off, felling Mrs. Jandorf and igniting her clothing. The maid and butler, also struck by flying bits from the shattered stove, tried to wrap Mrs. Jandorf in a rug and their own clothes took fire. “They succeeded after some time in extinguishing all the flames without calling the Fire Department. Then the butler summoned an ambulance. Mr. Jandorf was not at home at the time. 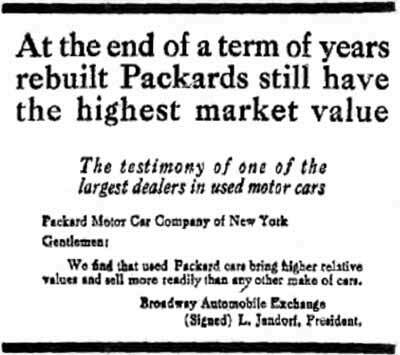 By 1935 the Jandorfs had relinquished their Manhattan flagship and relocated their sales operation to New Jersey where they held the Packard franchise for Elizabeth, New Jersey and surrounding Union County.